Onboard our chartered 30-seater Dornier aircraft from Platinum Skies, I steadied my eyes towards the window as our plane circled Calayan Island. I quickly gazed at the azure colored waters of Cibang Cove, recognizing it instantly from memories of my first visit here four years ago. 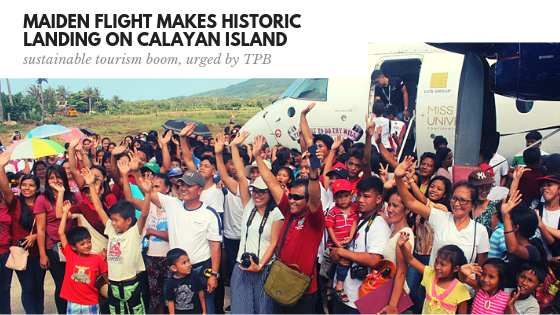 As our airplane’s wheels kissed the runway to signal the historic arrival of the first plane on Calayan Island, thrill reigned over me as I catch sight of the crowd lined up at both sides of the runway. They were all waving and clapping even after our plane rested on the apron. As the door opened and we stepped out one by one, I heard drumming beats and saw a group of locals adorned in colorful garbs dancing to merry tunes. It dawned on me how special this day is for the residents of Calayan. Beside the makeshift stage set-up on the apron of the airport, local performers strutted to a number of cultural performances. First was a Komedya, a play consisting of a battle dance depicting both the Christians and the Moro and a dazzling choreography featuring young women dressed up mimicking the piding, a flightless bird endemic to the island. After the performances, Tourism Promotions Board of the Philippines (TPB) COO Venus Tan and Calayan Mayor Alfonso “Al” Llopis took the stage to deliver a speech celebrating the momentous occasion. "Your source of livelihood won't be limited anymore to agriculture and fishing, it will now include tourism. This will be part of your alternative livelihood", Tan stated as she also lauded the efforts of Calayan LGU in fulfilling the long-standing dream of building an airport. Venus Tan also pledged the full support of TPB in marketing the tourism potential of the island, as she stated the importance of practicing sustainable tourism. 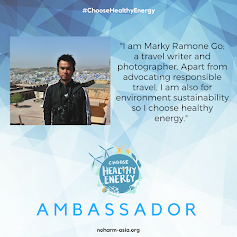 “Sustainable, ethical and responsible tourism or SER, should be practiced on this island. We, at the tourism department believes in the importance of not only preserving the environment but also our culture. Our unique culture that will attract the interest of many people” Tan added. While the new Calayan airport is expected to herald in new tourism, commerce and basic services development, Mayor Al Llopis likened the airport to the townsfolk’s resolve of achieving what seems to be a lifelong dream. “My grandfather Benedicto Llopis, who was Mayor in the 1960s originally envisioned building an airport. But decades went by and we weren’t able to secure funding from the national government”, Mayor Llopis narrated. Finally, before Mayor Al would finish his last term, the LGU was able to secure a loan from a bank and additional funding from the provincial government. The airport now gives Calayan residents a safer mode of transportation compared to the 7-hour lampitaw that usually braves the forceful waters of the Philippine Sea. “Many lives have already been lost. I cannot afford for the next generation, to have the lampitaw as their only option of transportation,” Llopis said. The man responsible in arranging the first flight to Calayan, Wakay Air Transport CEO Jerry Cabalce is hoping smaller aviation players would soon fly to Calayan. 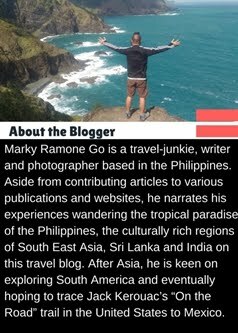 Both he and Mayor Llopis and with the help of the Tourism Promotions Board of the Philippines, are now starting to draft a tourism master plan that will ensure the rawness that make Calayan Island a dream destination of most travelers, will remain as it is despite the expected influx of tourists. As the program ended and the locals started lining for a tour inside the Miss Universe plane from Platinum Skies, I felt the significance of the day becoming more magnified. As I recounted the sight of the airport’s 800-meter runway from the air, it dawned on me how it looked like a line drawn by a hand from the heavens. Because after all these years of waiting, the stars finally aligned to gift the people of Calayan the airport they truly deserves.